A Little Vintage Trawl | Oh, for the Love of Vintage! Sorry I’ve been M.I.A. for a few days. I was off on a pleasure trip to Toronto for a little getaway. I had a great time visiting with friends, vintage shopping and having some amazing chocolate cake at Dufflet’s! 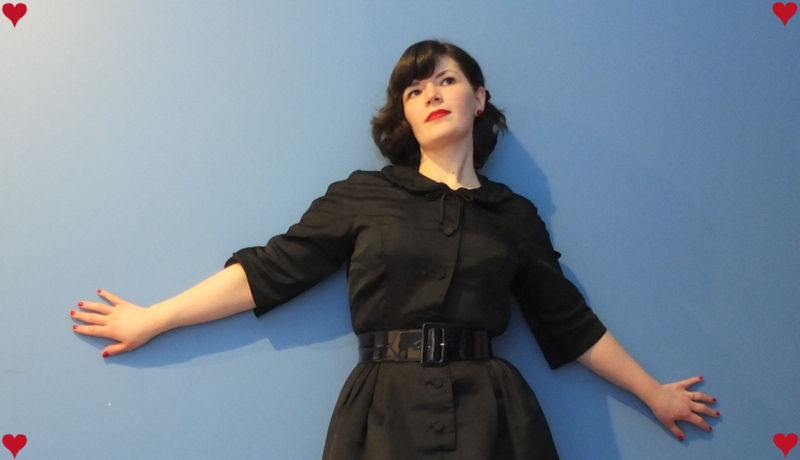 I purchased some lovely vintage dresses and brooches, take a peek below. 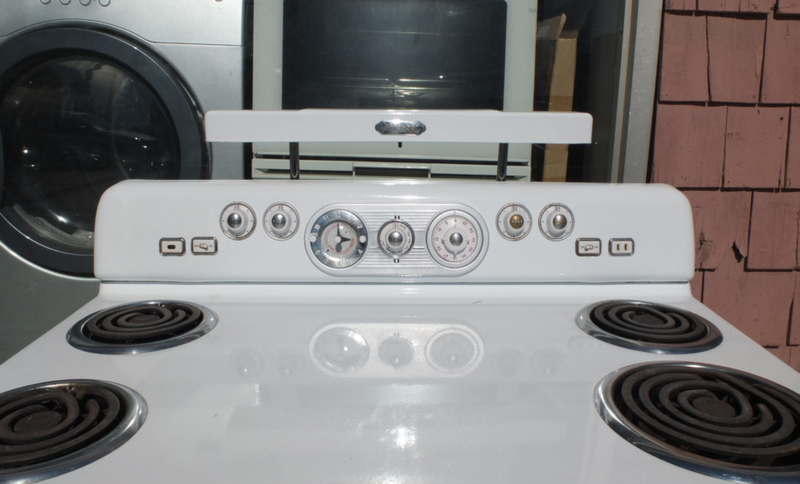 Just look at this amazing 1940s/50s oven! Sadly, I didn’t buy it. A friend of mine took me to a flea market, where I found some super cute vintage pins and a pair of lucite fan earrings. Note the 1940s chevron pin below and do check out my post ‘A Look at Chevron.’ Also, isn’t the umbrella pin sweet? I have a thing for umbrella pins. I’m not sure why, I just do! 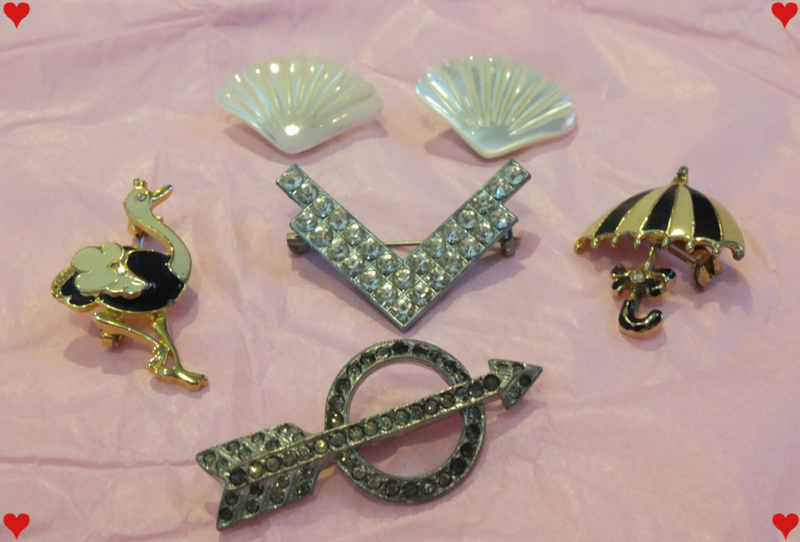 Stay tuned for an upcoming post all about umbrella brooches. 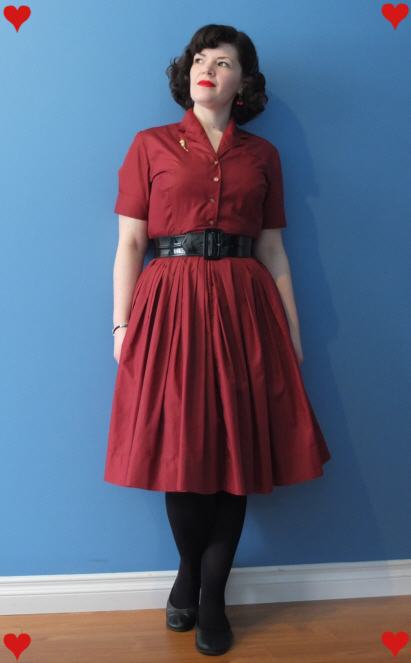 I couldn’t resist buying the Bettie Page Captain dress in red. It was on sale! I already have it in navy, but thought the red would be great for Spring and Summer. 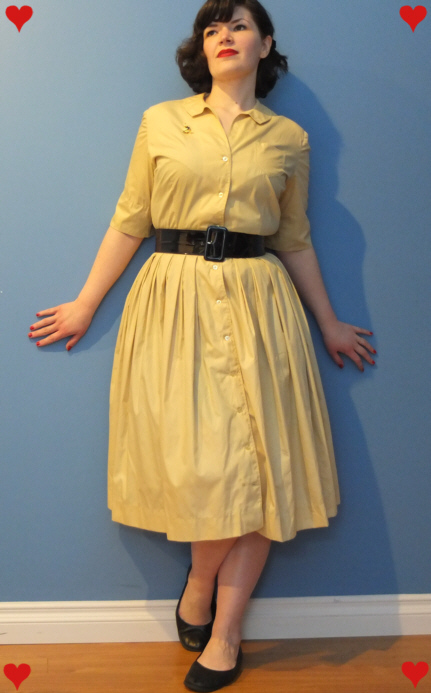 I also bought the below sweet late 50s/early 60s dress, it’s taffeta I believe. I love it and it fits me perfectly. I really do envy those in Toronto who can go to some great vintage stores all the time! 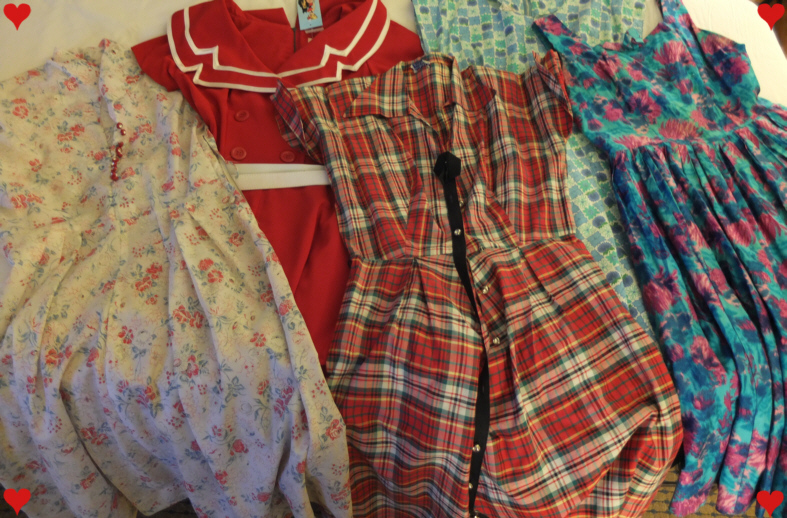 Last, but certainly not least, I bought several other 1940s and 50s dresses. I didn’t photograph them one-by-one, but you’ll be seeing them in future outfit posts! Sounds like an exceptionally good trip! And I bet you’re fun to go shopping with! I love ALL your finds and the jewellery is so pretty (I love green!). Looking forward to seeing your other frocks in future posts. Hi Katrin and Catwalk! It was a great trip and I was lucky to find the gems that I did. I cannot wait to wear the red plaid dress, I’ve been wanting a late 40s one for ages. This photo doesn’t do it justice. I’d love to see your cotton day dresses catwalk! The brooches do look green, weird! They are actually cream and black. Must have been my camera setting that made them look like that! Katrin, I love your illustrations by the way! You are very talented. Wow! I would have found a way to bring that stove home! Piece by piece if I had to. Jealous! Great finds. 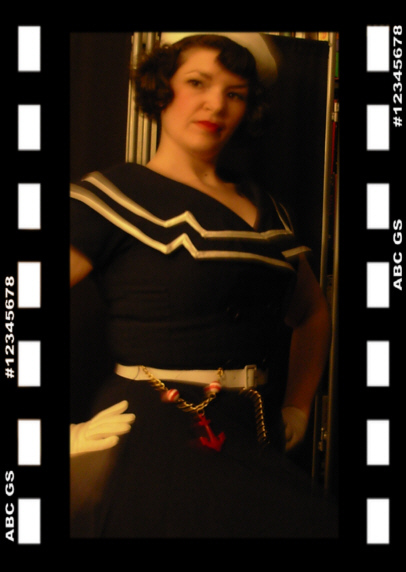 The Bettie Page Captain dress is amazing. Oh wow what a cooker! I like the way there’s space between the hobs, it can be so hard with the handles and steam when cooking multiple things! 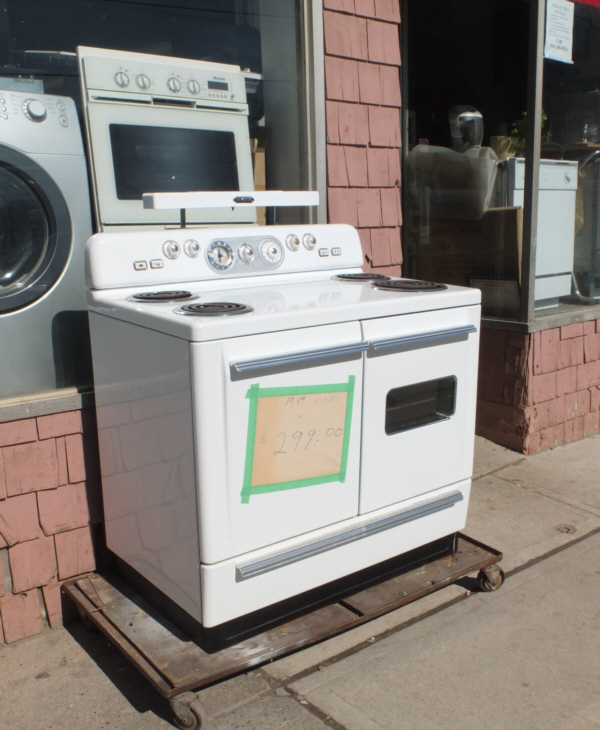 Have you ever seen one of the vintage ones with the deep fryer in place of one of the hobs? I don’t usually fry items, but I’d be tempted to make chips/fries and various Asian fried snacks in that. Midcenturyfella, I can so picture that stove in your house! Thank you Nelda, I can’t wait to wear the BP dress. Hurry up Summer! Catwalk, thank you for posting that! I love being able to see your great Summer dresses. Thanks for sharing hun! Dapperdolly, I know…it’s so darn cute! Appliances these days just don’t compare. Actually, I think your Chevron pin might be a WWII victory pin. No matter, it will look fab with your nautical wear. Love the shirt waist dresses, going to make some from some vintage patterns I have for this summer. Also love the brooches I collect quite a few myself. Which Toronto stores are your favourite? I live here and find a lot of them to be expensive or picked over.